Lynn Hovland Berry, 75, died unexpectedly December 1, 2018, at her home. She was born June 9, 1943, in Los Angles and raised in Playa Del Rey, California. She was the daughter of Carl Oscar and Marie Toomey Hovland. Lynn graduated from St. Bernards High School in Playa Del Rey, class of 1961. Following graduation she attended Northern Arizona University in Flagstaff, Arizona class of 1965. Lynn moved to the desert in 1991. She was a devoted mother to her four kids and they came first in her life. 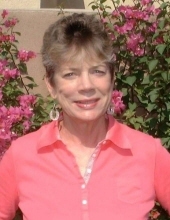 She was an avid tennis player and loved fishing in the High Sierras. In addition to her parents, she is predeceased, by her brother, Carl Hovland. Surviving are her sister Mary K Hovland and brother Tim Hovland. In addition, her daughters Gina Berry of Newport Beach, Cori Cooper, grandchildren Taylor, Kaysee, and Ricci of Palm Desert, sons Bradlee Berry and wife Torri, grandchildren Takoda, Taléa, Bodie, and Temae of Indio, and Brock Berry and wife Alexis, and grandchildren Beckett and Harlow of Indio. Father Lincoln will officiate a funeral mass December 12, 2018 at Sacred Heart Catholic Church, 43775 Deep Canyon Rd, Palm Desert, California 92260 at 2:00pm. Interment will follow at Palm Springs Cemetery, 31705 Da Vall Dr, Cathedral City, Ca 92234. Lynn, will be remembered as being a wonderful and loving daughter, mother, and grandmother and will be greatly missed. To send flowers or a remembrance gift to the family of Lynn Berry, please visit our Tribute Store. "Email Address" would like to share the life celebration of Lynn Berry. Click on the "link" to go to share a favorite memory or leave a condolence message for the family.